Happy St. Patrick's Day! I've hosted a St. Patrick's Day brunch at my house for 6 years but I'm not having one this year so I had to find another way to celebrate - themed desserts! You can buy specialty baked goods almost anywhere in Dallas, but I've rounded up some of the cutest, tastiest, (and some of the healthiest?!) sweets in town to celebrate St. Patrick's Day! 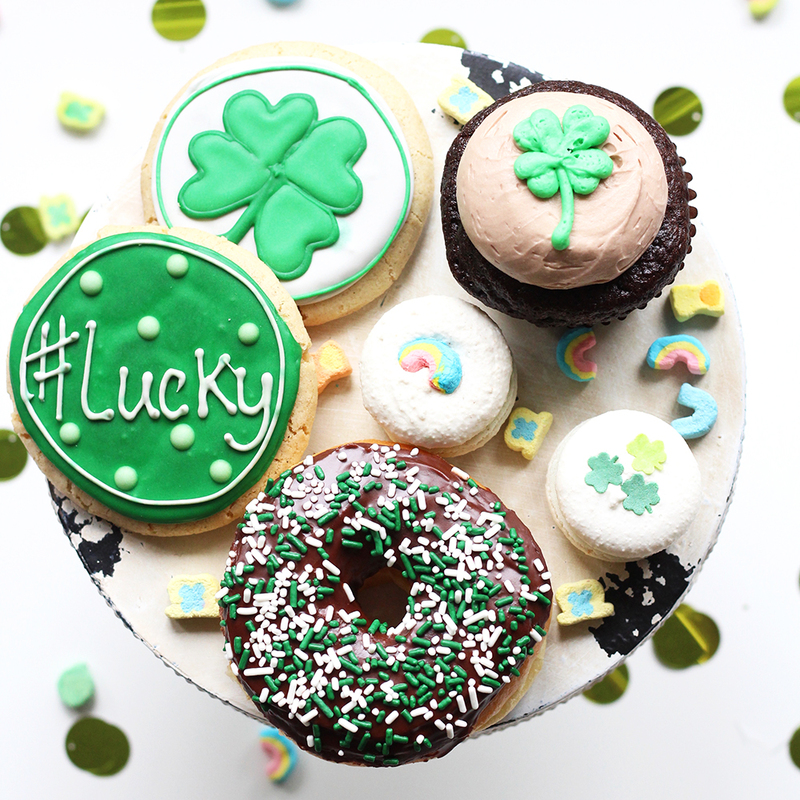 You're so #lucky! I teamed up with Katherine of My Dallas Obsession to gather and showcase these green beauties that would make St. Patty proud! We had a blast shooting (and taste testing ALL of) these special treats! First, every holiday should start off with a themed breakfast, right?! It's hard to go wrong with these donuts from Jaram's to start your morning off on a #lucky note! I consider myself somewhat of a donut connoisseur (not a good thing! ), so trust me when I tell you that these donuts are "worth it!" Definitely start St. Patty's day strong with a box of these sprinkled gems for work- your coworkers will thank you! Second, these colorful cookies were as tasty as they are cute, which is hard to believe because they are gluten free!! That's right, Unrefined Bakery is a gluten free bakery with a wide variety of fresh items daily, but I highly recommend their good old fashioned frosted sugar cookies! Beware, you will leave with more baked goods than you went in for! If you're looking for something a little stronger, you might want to try an Irish Cream Cupcake from the all-vegan bakery, Reverie Bakeshop! These specialty cupcakes are made with Bailey's and were the perfect texture and flavor! Excellent for an afternoon pick-me-up (and so cute)! Last but not least, the cutest macarons from Savor Patisserie, made with Lucky Charms! Their St. Patrick's macaron flavors are: Lucky Charms, Irish Coffee (made with Bailey's), Mint Chocolate Chip, and Pot of Gold (golden, brown sugar vanilla- my favorite!). All of Savor's macarons are gluten free, so go ahead and have two (or three!). 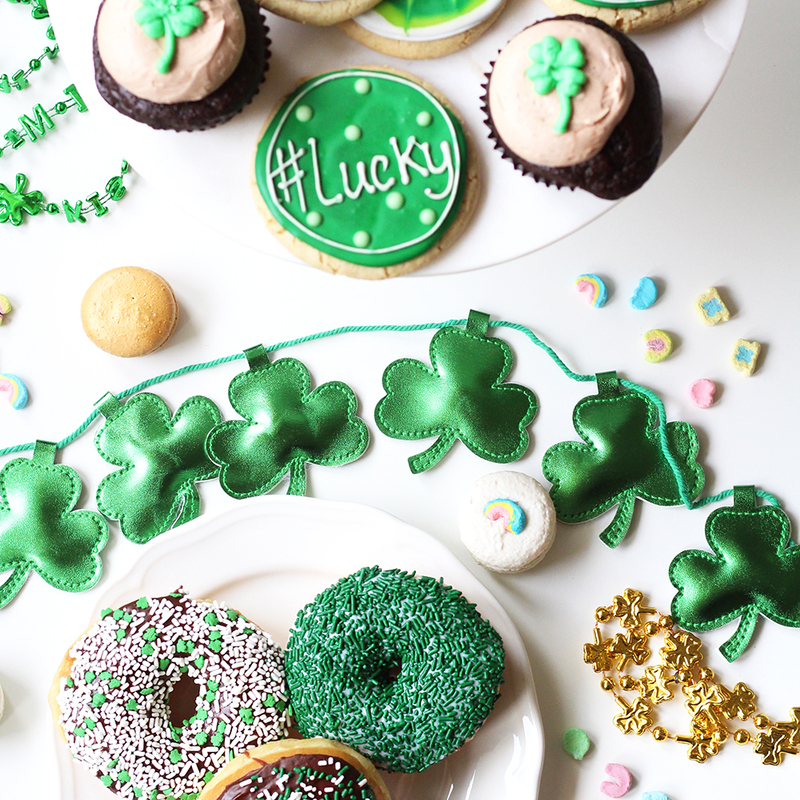 Now you know where to find the St. Patty's pot o' gold in Dallas and I hope you take advantage of these picture perfect treats while they're still available! Enjoy! Thank you to our post partners: Savor Patisserie, Unrefined Bakery, Jaram's Donuts, and Reverie Bakeshop. Thank you to Katherine of My Dallas Obsession for working with me to create this post.